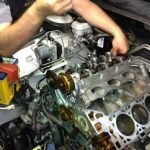 UMR Engines Brisbane can carry out all of your cooling system requirements, including blown head gasket repairs. UMR Engines has all of the equipment and machines to carry out your cylinder head repairs. UMR does not need to send your cylinder head off to be tested, (Like most mechanical workshops). The difference with UMR Engines is we do all the work in house, UMR Engines have all the specialised machines and equipment to carry out cylinder head machining, surface grinding, engine boring, block machining, full engine reconditioning, cylinder head reconditioning. alloy welding and crack repairing and much much more. Which in turn is better for you as your repair guarantee is with one company. Is your vehicle overheating ? So why go anywhere else ……? UMR Engines is a RACQ approved repairer, which is one of only a few shops that can remove the cylinder head and carry out the machining on the cylinder head. Come to UMR Engines for all of your blown head gasket repairs. We specialise in cylinder head gasket repairs to the following vehicles.